Isaac Heeney at AFLPA awards - September 16, 2015 Isaac Heeney is awarded the Best First Year Play at the AFL Players Association awards. Luke Parker won the AFLPA Most Courageous Award at Tuesday night's ceremony in Melbourne. Tuesday evening’s AFL Players Association Awards had a distinctly red and white flavour, with Swans players Luke Parker, Isaac Heeney and Mike Pyke claiming three gongs. Luke Parker, who is on the comeback trail from a broken leg, took out the award for Most Courageous Player, voted on by his peers. He follows in the footsteps of a Swans champion Brett Kirk, who won the award in 2006. Other past winners include Jonathan Brown, Luke Hodge and Joel Selwood. Parker was also named vice captain on the ’22 under 22’ team, an annual team of the best players aged under 22 years. QBE Sydney Swans Academy product Isaac Heeney claimed the Best First Year Player award. Heeney, 19, played 12 home and away matches in 2015, and made his AFL finals debut last Saturday against Fremantle in Perth. Heeney was just three years old when the last Swans players won the Best First Year Player Award, that being champion Adam Goodes in 1999. The awards for Most Courageous, Best First Year Player, Best Captain and the MVP are voted on by all AFL players in 3-2-1 system. Players are not permitted to vote for their own teammates, but for players at the 17 other clubs. Ruckman Mike Pyke took out the Education and Training Award, for the player who has achieved outstanding academic success. The 31-year old recently graduated with a Masters in Commerce (Finance) from the University of Sydney, while for the past three years, Mike has worked on the equities and fixed income trading floor at club major partner Citibank. The major award of the night was taken out by Fremantle midfielder Nat Fyfe, who collected his second successive AFLPA MVP Award. 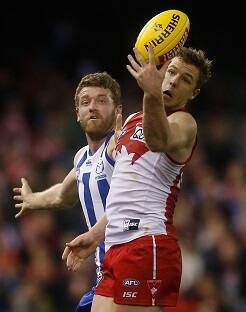 Dan Hannebery was the highest placed Swans player in the final voting, finishing sixth with 162 votes.